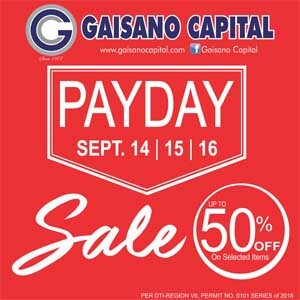 with Midnight Sale on September 14 ( Friday ) at Guanco & Central Tacloban. September 15 ( Saturday ) at South, Danao Main, SRP, Island Mall Mactan, Tisa, City-Iloilo, Kalibo, Ozamiz, Pagadian, Surigao, Masbate & San Carlos. Extended Store Hours on September 14 ( Friday ) at South & One Pavilion Mall.